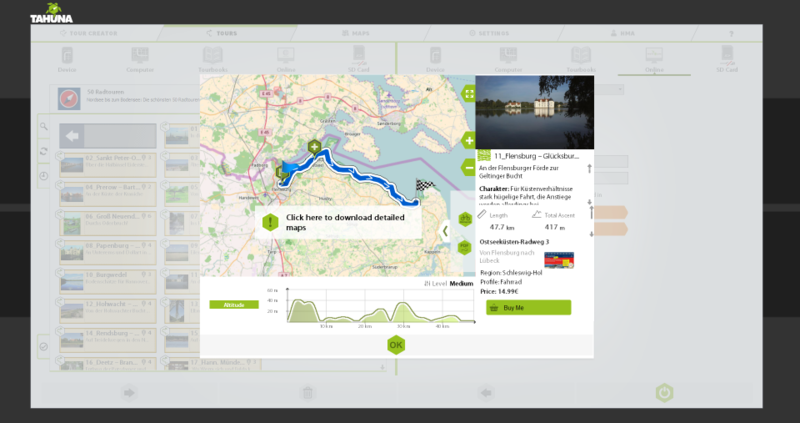 The Tour viewer is a window that shows the route on a map with detailed information about the tour included. It can be closed with the ‘OK‘ button at the bottom of the screen (see the picture above). A map showing the whole tour by default. It uses the settings you set on the Tour Creator tab. You will find standard controls over it (Zoom In, Zoom Out, Full screen). Clicking the full screen button will fill the whole screen and hide all controls (except map controls and the chart, which can be hidden manually). Clicking the full screen button again exits this view and takes you back to the previous window size. This button is visible if the tour is editable, meaning it was opened from the local file system, a tourbook, a device, etc. 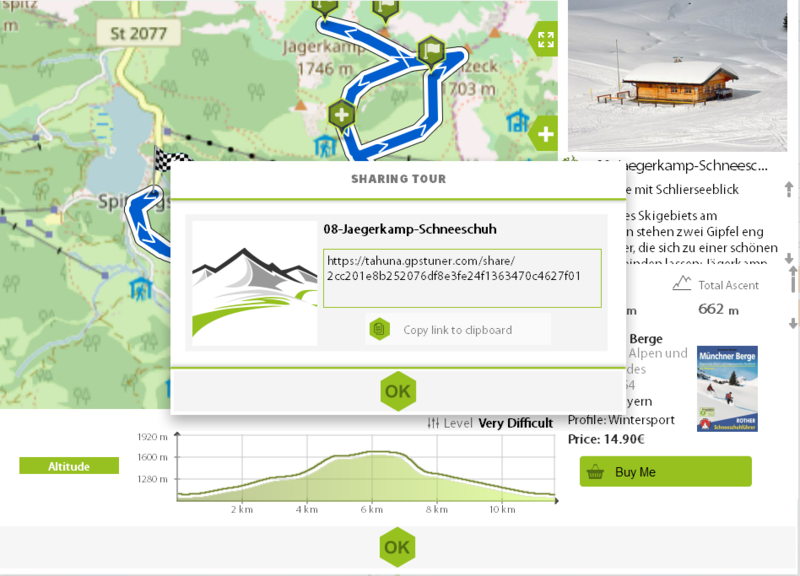 The button is hidden if the tour was opened from an online source (3rd party sites or online tourbook). Clicking it will close the tour viewer window and take you to the Tour Creator tab for editing. This button is only visible if the tour was opened from an online, 3rd party source (e.g. GPSies, RouteYou, Wandermap, Bikemap). Clicking it will open the corresponding website in a browser window. This generates a printable PDF page using the information shown in the tour viewer window. Once it is ready, the PDF is opened in the default PDF viewer software (see the picture above). It contains folding lines so you can fold it and slip it into your bag’s map pocket. 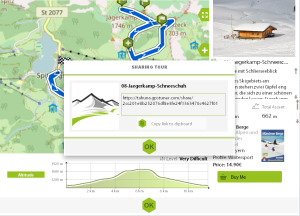 The Share button is only visible if the tour was opened from the local file system, a tourbook, a device, etc. The button is hidden if the tour was opened from an online source (3rd party sites or online tourbook). 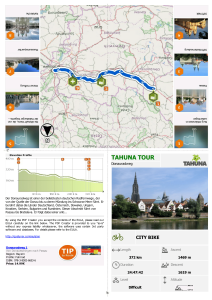 The button is always enabled, but if you are not logged in to a Tahuna Account, it displays a popup saying “Sign in with your TAHUNA account to share”. Clicking ‘OK‘ closes the popup and opens the login screen. Otherwise, clicking the button brings up a popup that lets you cancel the operation and closes the screen. If the operation fails, the popup is closed and a new one is opened showing the text “Failed to upload, try again?”. It contains a ‘Try Again‘ and a ‘Dismiss‘ button. Clicking ‘Dismiss’ closes the popup, clicking ‘Try Again‘ closes it too, but restarts the procedure (as if the Share button was clicked again). If the upload is successful, the popup is closed and the “Sharing Tour” dialog opens. – An ‘OK‘ button that closes the popup.